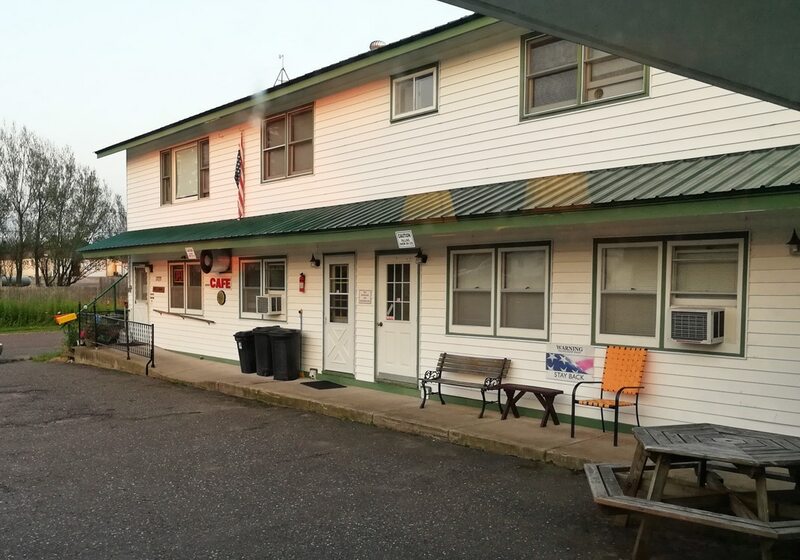 As I drove the long stretch of empty road in Michigan’s northern panhandle, I was starting to think I had made a mistake by not booking a hotel in advance. I assumed I’d be able to find some sort of roadside lodging for the evening on my way toward Wisconsin, but so far I had come up empty. There were very few hotels on this road, and they were overpriced. It was starting to get dark, so I was pondering my options. Pitching a tent on the side of the road was starting to seem like a more realistic option with every passing minute. As I raced down the road, I thought I spotted a motel on the left. As I sped past, I wasn’t sure if the place was still in business, because it looked dark and there was only one car in the parking lot. The place didn’t look very inviting, but since I was short on options, I pulled a u-turn and headed back that way. Sure enough, it looked like a legit motel, albeit one that hadn’t seen a facelift in decades. I cautiously tried to front door of the office and was eventually greeted by a nice older woman who informed me that, yes indeed, they had rooms available. And the price was only $45/night. Sold! Okay, here’s where things got weird(er) . The receptionist/probable owner told me she didn’t accept credit cards. 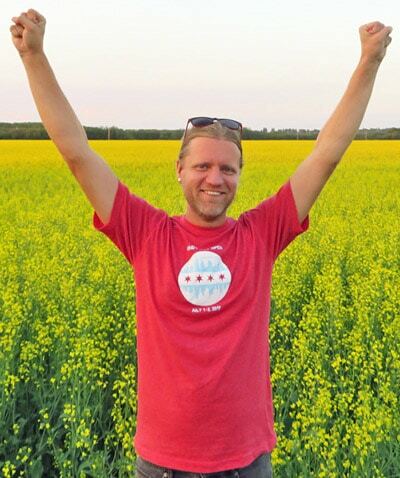 I could pay with cash, but they didn’t have an ATM, so I’d have to go back to the gas station a mile up the street. Or, she said, I could pay with personal check. My mind raced with excitement with those words. I really was back in the ’70s! 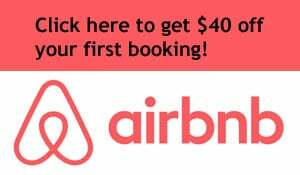 Paying for a motel room with a personal check in the year 2017? That was a life experience I needed to have. Fortunately, due to an unusual set of circumstances, I had my checkbook with me in the car. So I wrote out a check, grabbed the room key and headed for my temporary home. After three straight days of tent camping, I was ready for a shower and a bed, no matter how scary. The motel felt like such a time warp. It felt like I had been transported back to 1979. I was staying at the cliché hotel you see in all the old tv dramas. 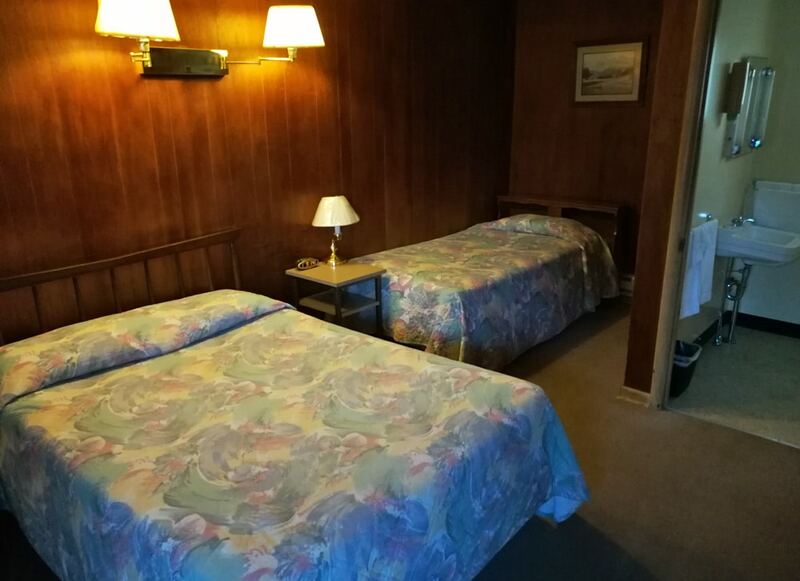 When I opened the room door, I was greeted with a wall covered in wood paneling. Oh no, I was definitely in an episode of Murder, She Wrote! Or maybe the Bates Motel. It reminded me of the hotel rooms I stayed at with my family when I was a kid. I got the sense that nothing had changed at this place in the past few decades. 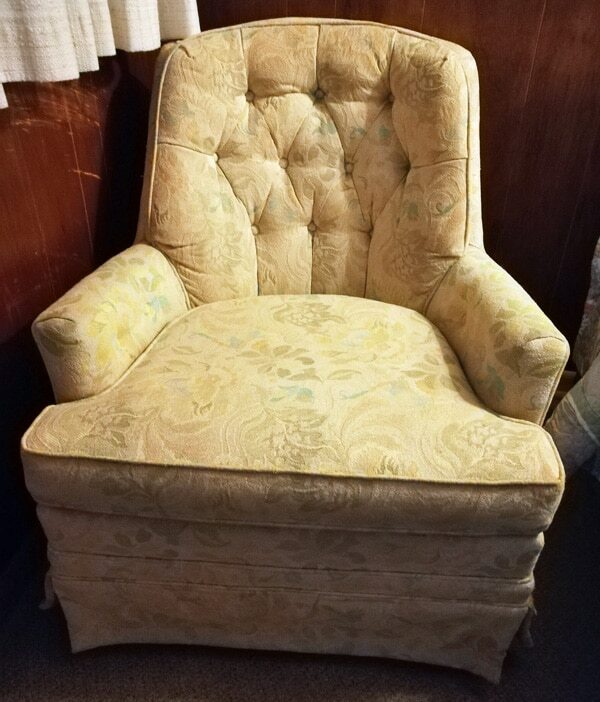 Look at this armchair. I was excited to be the first person in probably 40 years to sit in this chair! I’d kill to have a vintage treasure like that in my own home. Perhaps I should have made them an offer. I was expecting to hear voices in the middle of the night, or to have blood coming out of the shower. But the night was surprisingly uneventful and I got a solid night’s sleep and went on my way the next morning. Okay… that last paragraph was completely made up. But everything else in the story was true. I did manage to find the most antiquated hotel in America, and I stayed there, and it was strange and unnerving and slightly creepy. I would totally do it again.